Having learned how to make money online by creating a free blog, with Google blogger, the most important thing you should have at the back of your mind before setting out to create a blog is the niche. 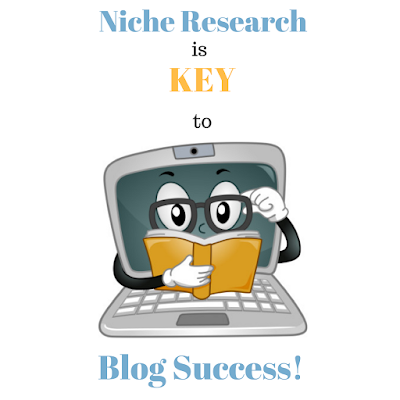 Niche, simply put is the subject matter you want to create your blog around. It is the main theme of your blog, the focal point, what exactly you want to blog about. Unless your are blogging just for the fun of it, you've got to do some research before selecting a niche. If your goal is to create a profitable blog, a blog you want to make money with, then you can't just select anything and create blog on it. You have to research and select a profitable niche. What am I very good at? If you create a blog based on what you are very good at, creating content for your blog will not be a problem. What is my hobby? If your blog theme centers on your hobby, it will be very easy to create content for such a blog. But when creating a blog around your hobby, you have to be sure your hobby is something that others are interested in. Hobbies like football or sports generally sell very well. What new thing do I want to learn. You can put up a blog based on a discipline you are interested in. As you learn you can share your new acquired knowledge with the world in your blog. Remember the more you teach something the better you become in it. Having done that you are likely going to come up with great ideas you can build your blog on. But since your aim is to make money from your blog, you have to test those ideas to see whether they are on demand. This is where niche research is important. As stated earlier, if your aim is to make money from blogging, then you have to create a blog based on what is on high demand - what information people are searching for. 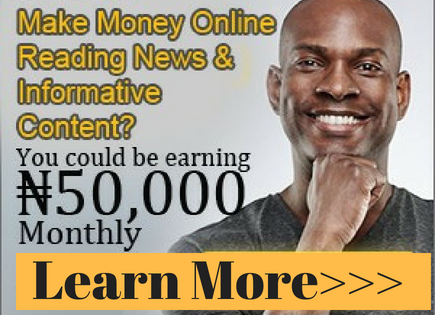 Examples of hot niches in this part of the world are how to make money online (who does not want to make money after all), love/relationship niches, family life, job/career niches, health related niches and entertainment niches. There is certainly a huge market for you if you can create a blog around any of those niches. There are several strategies to help you generate niche ideas. Let's quickly run through some of those strategies. Your Immediate Environment: Find out What are the challenges/problems in your environment? Can you offer a solution for any of the problem you identify? Then create a blog that will offer the solution. For example, one of the major problems in Nigeria, and the world at large is unemployment, can you build a blog that can offer a sort of solution maybe by offering career tips and the likes, advice on how one can make him/herself employable, or tips on how to become one's own boss. Your Hobbies: As earlier mentioned, you can create a blog around your hobbies. Let's say your hobby is traveling like myself - you can create a blog on traveling. You can share your experiences based on all the places you've traveled to, what to do and what not to do in such places. Or if your hobby is football, there is a huge market for you in this niche, particularly with the advent of online sport betting sites today. The Media: Yes, you can generate niche ideas through the media, for example, news on radio, television, newspaper and even social network. You do this by looking at the trends on such platforms. What is it that many people are talking about? Can you offer any information on it? If yes then create a blog around it. Online Software for Generating Niches: You can use online tools to generate niche many ideas at a time. We will quickly consider some of those tools here. Google Adwords: When you enter words like "how to", "learn how to" "best way to" into keyword research tools like Google Adwords, you will get tons of ideas you can build your blog on. For example a search for "money making" generate a host of ideas from Adwords platform. Head over to https://adwords.google.com. I guess by this time you are already signed in to your Google account. If not you will be required to sign in, and if you don't have a Google account yet, you can sign up. It takes less than 5 minutes to sign up. 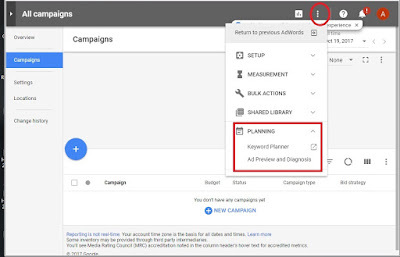 As can be seen on the screenshot below, once you are signed in to Adwords account, you will see 3 vertical dots on the top right hand corner of the page (indicated with a red oval shape in the picture below). Click on it to reveal menu items. Select the menu item that reads "Planning" and the option "keyword Planner". This will open in a new tab, you can take a little time to familiarize yourself with the platform. There is a link at the top right hand corner of the page that reads "How to Use Keyword Planner". Click on it to go to keyword planner tutorial page. the newly added function to get forecasts for campaigns or keywords from your account. Since our goal here is to get keyword ideas for our would be blog, we will go with the first two options. We first get the keyword ideas, and then get the search volume for our keyword(s), to see whether people are actually interested in our niche keyword. Now select the first option and enter your keyword. For the box that says "Website or landing page", you can leave it blank or enter the website of your competitor to have ideas of the keywords they are using. However, if you cannot beat them in competition don't do this. Select a category that best fits your ideas and hit the "Get keywords" button. You can target your search by date range or by location, where you can specify the countries you are interested in. You can do a whole lot of research with the platforms, so play around with it and get used to it. Google Suggestions: This is another great tool to help you in your niche/keyword selection strategy. It's a way to get long tail keyword ideas. When you type 2 to 3 words into Google search box, there is usually a list of suggestions displayed. You can type in the idea you have in mind and watch out the the words that Google will bring up. These could a source of great keywords. Google Trends: This tool gives you ideas of how your niches has been changing in demand over time. For example, a search for "money making" gives a graph of how the niche has been rising and falling over time as can be seen in the screenshot below. This gives you idea of whether the demand for the niche is on the rise or on decline. 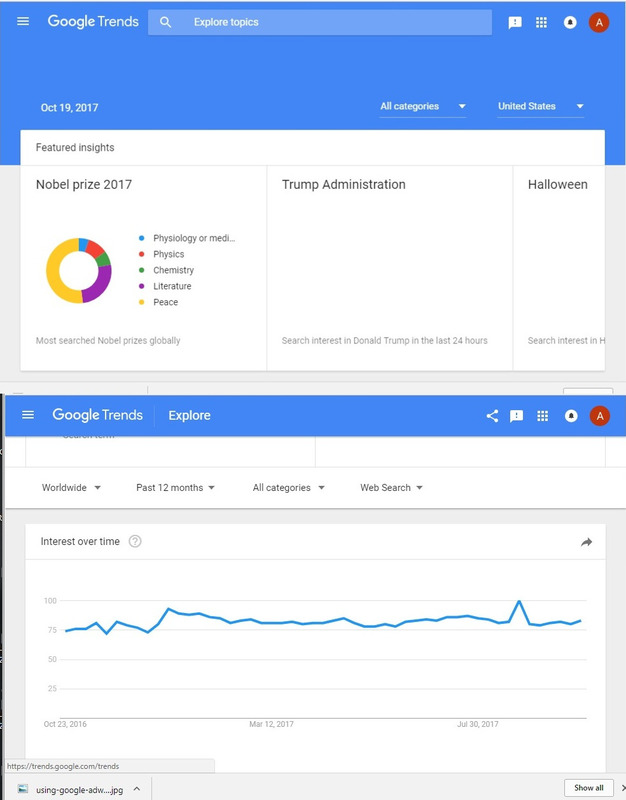 To do that just head over to http://www.google.com/trends, as you can see in the screenshot, it is clearly stated on the search box "Explore topics". 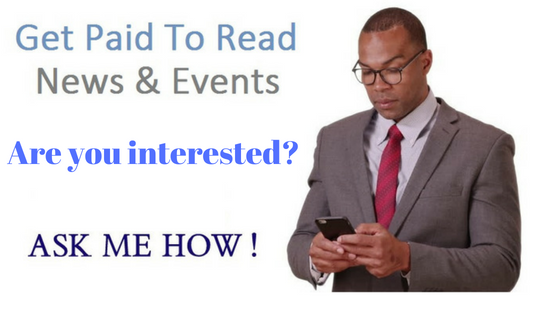 So the tool is for you to explore your niche idea to find out whether it's profitable or not. So type in your idea into the search box and hit the enter key on your system (return key for Mac users). 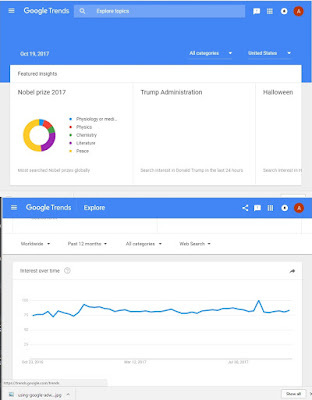 With Google Trends you can also target your research by worldwide searches or country specific, date (for the last 12 months, or 2 months or any time), category or for web search, video, Google Shopping, news search or even Youtube search volume. You can even target by interest and religion. What affiliate programs do is to offer you ideas of what is popular based on what products are selling or what are the most popular searched items. For example eBay gives you such ideas. Head over to http://www.ebay.com, select a category and scroll down toward the bottom of the page at your left hand side. You will see the option "Popular Brands".Just click on it to reveal categories of popular items. Select any category of interest. For example, a click on camera and photos reveal a list of popular items under this category. If you take the time to go through all these niche selection strategies, you will be armed with a host of profitable niches that you can create your blog with. Having arrived at the niche of your choice, the next thing is to select keyword/keyword phrases to use in creating content for your blog. Just as niche research is important so also is keyword research for content creation.